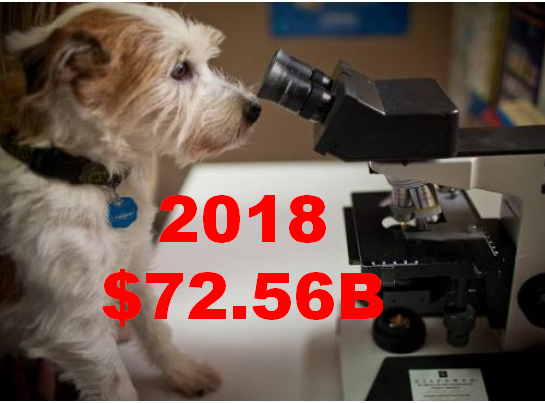 According to the numbers from the American Pet Products Association (APPA), the total U.S. Pet Industry increased $3.05B (4.4%) in 2018 to $72.56B. This is slightly more than last year’s increase of 4.1% and very consistent with the 4+% annual growth rate since 2011. There was one notable exception to the “norm”. In 2016 the industry grew 10.7% due to an upward adjustment in Food $ which research had shown to be too conservative. However, the industry has gotten “back on track” in the last 2 years. As you recall, 2017 brought considerable excitement with a record low inflation rate of 0.4%. This meant that 90.2% of the increase was a real increase in the amount of Pet products and services sold. In 2018, the pricing turned up by +1.25%, a more normal rate. Sales continued to grow but the amount of real growth fell to 70.6%, also a more normal number. However, these are “summary” numbers. Each segment has a different story to tell. In this report we’ll take a closer look at the performance of the total market and importantly, the individual segments. The report will cover 2018, but also put this year’s numbers into perspective for the period from 2009 to 2018. Here are the specifics from 2018. After record deflation of -1.1%, Pet Food segment pricing stayed low, maintaining the highly competitive market. The drop in live pet sales occurred as projected. This critical industry segment continues a gradual decline. 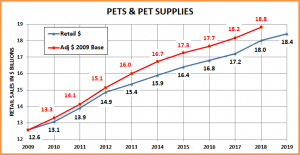 Pet Supplies flipped from deflation to inflation, the highest rate since 2009. Sales surprisingly increased greater than anticipated, but 22% was due solely to price increases. The inflation rate in the Service segment more than doubled. This means that the drop in the amount of Services was actually -3.2%, 4 times greater than the drop in retail dollars. Veterinary pricing also moved up from a record low rate. This probably caused a slight reduction in frequency, so they didn’t meet the projection. 43% of the increase was due to inflation, which is actually low for this segment. The Total Pet Market was up 4.39% as the Product segments beat their projected numbers while the Service segments missed. The upturn in prices definitely hurt both Services and Veterinary, probably through reduced frequency. The Food segment retained “the low ground” in prices and continued to expand upgrades. The Supplies segment quite remarkably avoided the usual negative impact that inflation has on sales. The Chart below may make it easier to compare the situation in the individual Segments. Now let’s take a look at the performance of the individual segments from 2009 through 2018 starting with Food. 6.26% Annual Growth Rate (Driven up from 4.64% by the 2016 adjustment in Food $). 5.72% CPI adjusted Growth Rate: Over 91% of the growth since 2009 has been “real” – Truly amazing! 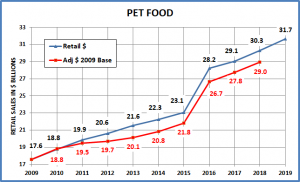 After 2013, deflation has been the norm in Pet Food. In a need category, this usually slows retail sales. You don’t buy more food because it is cheaper. However, this occurred at the same time as the introduction of super premium foods. This has produced the unusual situation of growing retail food sales despite extraordinarily strong deflation. The Pet Food Market is the most competitive in history. Manufacturers, Retailers and whole Retail channels, including the internet are now actively engaged in a furious battle for the consumers’ pet food $. This price war is initially great for consumers and has allowed a much deeper demographic penetration of super premium. However, it is putting increased profit pressure on the supply and distribution channels. This could be bad for all, including the consumer, thru reduced choices. Prices may have “bottomed out” in 2018. A reasonable inflation rate, perhaps 1%, might be best for the future. Until the uptick in 2018 and excluding the 2016 adjustment, the annual retail growth rate has generally been slowing. At the same time, deflation has caused the “real” growth rate to increase since 2014. Deflation essentially stopped in 2018 and they “met” at +4.5%. What will happen in 2019? Through February the CPI is up 1.5% vs 2018. Last year it was deflating. We don’t know if this will continue or how it will impact spending. It’s time for yet another new, “must have” upgrade in Food to keep consumer spending moving up. Prices have deflated 5 times in 9 years but in 3 of the last 4 years they have turned up. Retail Sales – Supplies had been price sensitive with increased growth rate tied to deflation. That was not the case in 2018. However, over the whole 9-year period, the Consumer bought more…and paid less! Price Adjusted annual growth rate is 4.59% – 12.5% higher than the retail rate – which is beyond Amazing! After the Recession consumers became much more price driven. This had a huge impact on Supplies as most purchases are discretionary and many categories have become commoditized. The first deflationary year was 2010. The Consumer responded very positively with a 6% increase in “real” purchases. This trend continued through 2014 with “real” purchases showing an annual increase of 5.9%. Then prices leveled out in 2015 & 2016 and the increases in both full retail and price adjusted sales fell to the 2.5% range. In 2017, deflation returned but was not as impactful as in the past. The increase in retail sales was the lowest since 2009 and “real” sales were up less than 3%. 2018 brought a change to the pattern. Inflation was stronger, +1% but so were retail sales, +4.7%, the biggest increase since 2012. Ideally, we probably need to get to about a +0.5% rate. Now on to the Service Segments – First, Non-Vet Services. In 2018 the Inflation rate more than doubled the rate of 2017. It had been declining then fell precipitously in 2017. The annual average since 2009 stands at 2.27%, which is second to Veterinary and the gap is narrowing. Years of inflation may have caught up to this segment as the spending increases in 2016 & 2017 were about half of the increase in 2015 and spending actually decreased in 2018. 65.5% “real” growth since 2009. In 2017, this reached 84%. In 2018 the decrease in the amount of services was actually – -3.2%, undoubtedly due to a drop in frequency. 75+% real growth is probably a realistic goal. In the past there have been no big negatives regarding this segment. It is largely driven by discretionary spending, so the consumers’ household income is a bigger factor in spending in this segment than any other. Years of relatively strong inflation did not retard growth. In 2017 increasing competition from a growing number of outlets offering pet services had an impact, as the inflation rate fell to 1.1% in 2017 – a near record low. In 2018 the inflation rate doubled to a more normal 2.4% but this time the consumer noticed. A drop in visit frequency produced the segment’s first decline in spending. It certainly demonstrates that even the Services segment is not immune to the consumers’ focus on price. 2019 sales are projected to bounce back, increasing 3.3% to $6.1B. This is 47% below the growth rate since 2009 and except for 2018, the lowest ever. Prices through February of 2019 are 3.9% higher than the same period in 2018 so it appears that the inflation rate is growing. If this segment has developed more price sensitivity, this does not bode well for spending in 2019. However, if the many outlets offering services start to see a continued drop in visit frequency, this could cause another price war, but this time with increased spending. 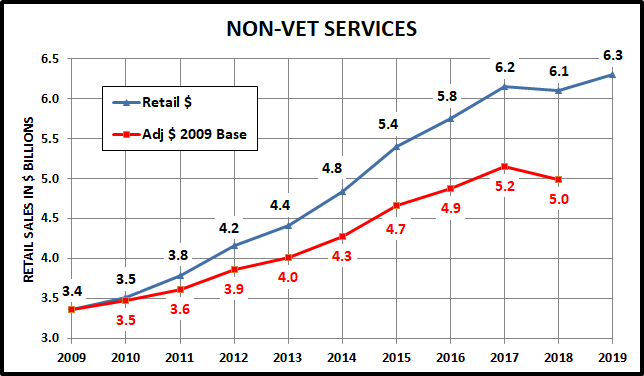 Now, let’s take a closer look at the Veterinary Service Segment, which accounts for 25.0% of Pet Industry Sales. Annual avg CPI increase is 3.32% since 2009. 2017 had a record low, 2.2%. 2018 was up but still below average. Adjusted Growth rate since 2009 is only 1.28%. However, it has been up sharply the last 2 years. Price increases account for 72.5% of the total sales increase from 2009 to 2018. 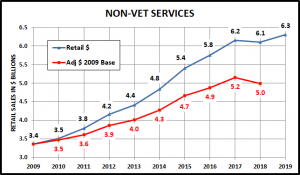 Consumers actually bought less in the amount of Veterinary Services in 4 of the last 9 years. They just paid more. Inflation fell to a record low in 2017 and stayed low in 2018. This produced a $2.1B increase, with 61% “real”. Regular Veterinary visits are generally viewed as a “need” not a “want”. However, the high inflation rate over the years finally reached a point where Pet Parents, especially those with income pressure, started delaying or foregoing regular procedures entirely. They looked for substitutes in OTC medicines, supplements and treatments whenever possible. They also turned to “no appointment” clinic days offered by some non-pet retailers to get vaccinations and other procedures at radically discounted prices. Then the Veterinary Services inflation rate turned sharply downward in the 2nd quarter of 2016. It set a record low rate in 2017 and stayed low in 2018. Pet Parents responded. 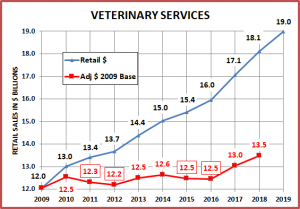 They increased the frequency of visits and sales in the Veterinary segment rose $2.1B over 2 years. 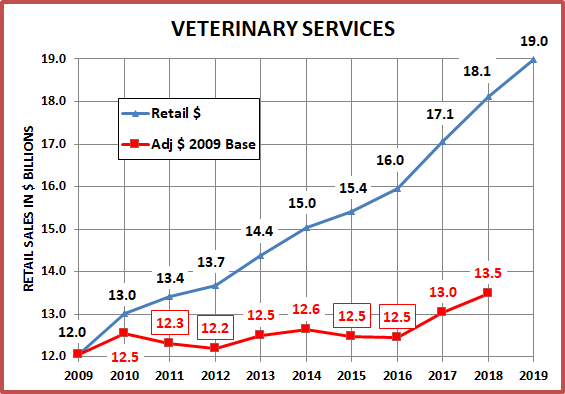 Veterinary Sales are projected to increase 4.8% in 2019 to $18.98B. This percentage is down from the past 2 years. One key factor in the continued strong growth in this segment appears to be maintaining an inflation rate of 2.5% or less. Inflation turned up in the 4th quarter of 2018 to 2.8%. In 2019, the prices through February are 3.1% higher than the same period in 2018. This is definitely concerning, but the first quarter often has the highest inflation rate in this segment. We will just have to monitor the CPI and see what happens. Now we’ll wrap it up with Total Pet. 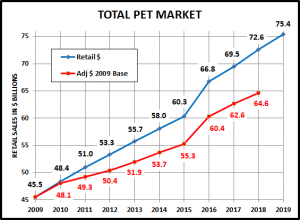 Total Pet Retail numbers are a big reason why so many people are attracted to the industry. The retail numbers had been good across all segments, until 2018 when Services $ fell. As our analysis has shown, to get the “real” story you need to look a little deeper into “petflation” and the actual amount of goods and services being sold. In recent years the industry has been struggling with deflation in Food and Supplies and inflation in the Veterinary Segment. In 2018, Food prices were flat and the other segments turned up. As a result, the Total Pet inflation rate rose to a more “normal” level. Supplies prices have deflated 5 times in 9 years. Commoditization and a lack of innovation have created extreme competitive pressure which deflates prices. 2018 brought strong inflation for this segment +1%. In the past, even a small increase in CPI slowed sales. In 2018 this was not the case. After record -1.1% deflation, in 2018 Food prices essentially paused at that low level. Food has deflated 5 of the last 9 years. 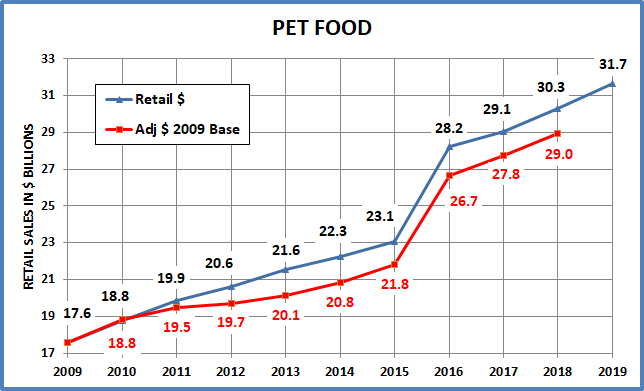 However, unlike Supplies, the Pet Food segment has been fueling growth with premium upgrades. After years of strong inflation and flat “real” sales the Veterinary segment finally got the word. A record low 2.2% inflation rate in 2017 followed by 2.6% in 2018 produced $2.1B in increases and 61% was real. Keep it up! Pet Services has had consistent growth and the number of outlets has radically increased. In 2017, due to this competitive pressure, the inflation rate fell to 1.1%. In 2018 inflation more than doubled and sales fell. 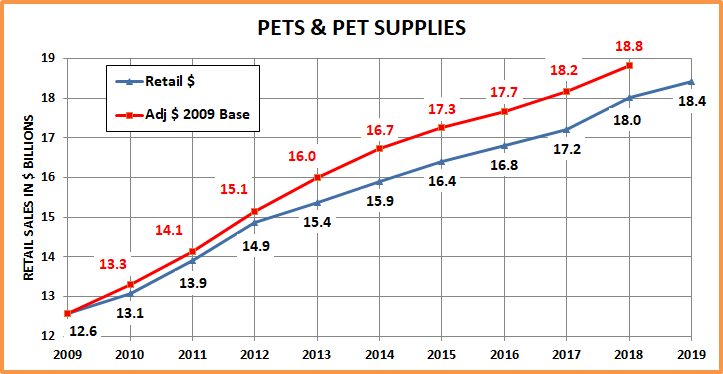 Here’s the graph of Total Pet Sales since 2009. 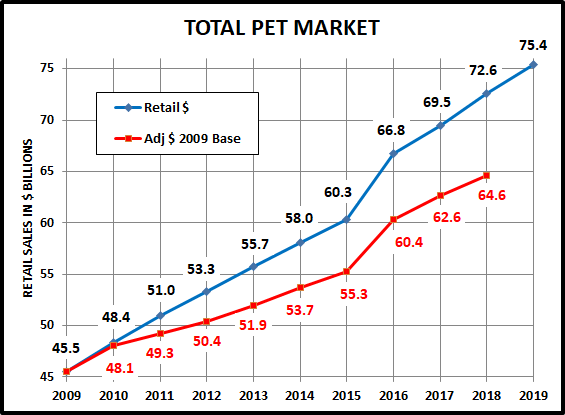 In 2019 Total Pet Sales are projected to increase 3.9% to $75.38B. Although 3.9% would be the lowest increase since 2009, it could be challenging to achieve. One of the key factors in achieving these numbers is reasonable inflation. Strong inflation began in all segments at the end of 2018 and continues into 2019. The CPI for Total Pet through February is 2.8% higher than the same period in 2018. That’s a tie for the highest rate since 2009. If this continues or grows, it could definitely depress sales. A new premium food trend would be very welcome. Remember: It’s up to industry participants to make it happen!